For the last few months, Aaron and I have been making a concerted effort to get out of our usual food ruts and try new recipes. We’ve been gravitating towards meals we would order at restaurants or get as take-out, and trying our hand at simplifying them into homemade versions that are easy enough to tackle on busy weeknights. That’s how our favorite Tofu Banh Mi Bowl came to be, and also how this easy Vegan Pho made its way to the top of our must-make list. I am such a fan of broth-y soups, especially when they involve chewy rice noodles and finely sliced vegetables. I had previously held off on making pho because I’m by no means an expert in Vietnamese cooking and I was a little intimidated by the broth. If you’re a regular reader, you might also remember that while I love vegetables, I don’t have much patience for anything other than rough chopping them. That all changed late last year when I received the Börner V5 PowerLine Mandolin (which I swear by whenever I make Banh Mi Bowls) and their Roko Julienne Slicer. For today’s recipe, I was able to use the Roko to julienne ginger and carrots in under 5 minutes, and dice an onion so fast I didn’t even shed a single tear! Another happy result was that because I was able to slice my veggies really thin, all of their flavor was extracted with a quick simmer and my broth ended up becoming very flavorful in hardly any time at all. Initially I wasn’t sure how much I could simplify vegan pho without compromising on taste. In the end, both Aaron and I were blown away with how awesome this recipe turned out. 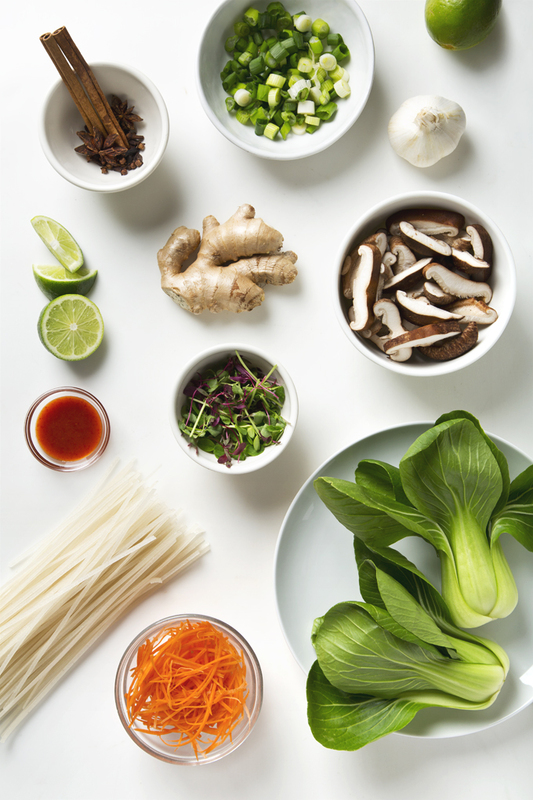 I love the unique flavor that the star anise, cloves, and cinnamon stick lend, the noodle-y texture of the julienned carrots, the vibrant green bok choy, and the meaty sliced shiitake mushrooms. We like to top ours with baked tofu for protein, lots of bean sprouts, chopped fresh cilantro, a squeeze of fresh lime, and sriracha for heat. 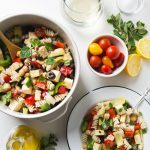 This is one of those meals that has all of the great flavors of your favorite restaurant version, but it’s prepared in a really wholesome way and for a fraction of the cost. 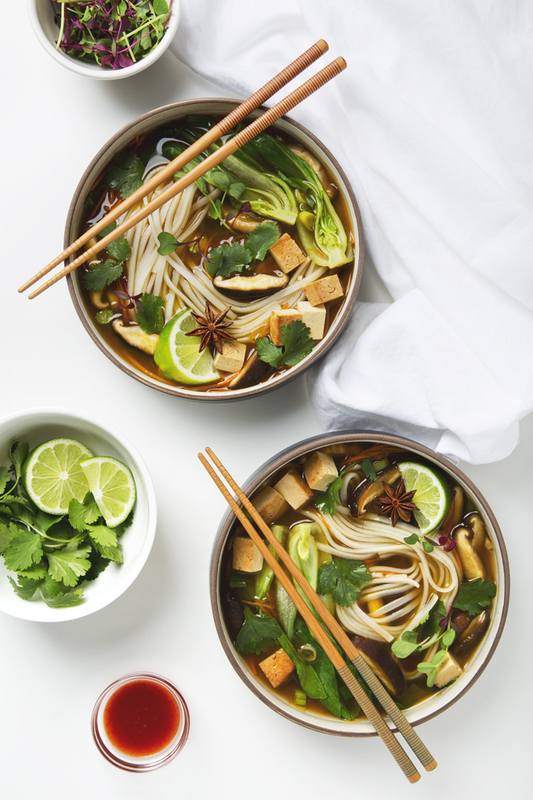 It turns out that it is possible to make delicious vegan pho at home, and in 30 minutes to boot. 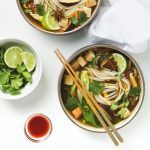 Easy vegan pho made from simple ingredients and ready in 30 minutes! Top with baked tofu for protein, bean sprouts, cilantro, a squeeze of fresh lime, and sriracha for heat. This vegetable pho is extra quick and flavorful! In a medium pot over low heat, dry roast the star anise, cloves, and cinnamon stick. Stir until fragrant (about 30 seconds). Add the vegetable broth, onion, garlic, and ginger. Cover and bring to a boil. Reduce the heat to low and simmer for 15 minutes. Strain and return the broth back to the pot. Add the carrots, shiitake mushrooms, soy sauce, and green onions. Simmer for 10 minutes, then add the bok choy. Simmer for 2-3 more minutes, or until fork tender. Add salt and pepper to taste. Divide the cooked rice noodles between two bowls, then portion the pho over the noodles. Top with tofu, bean sprouts, cilantro, lime slices, and sriracha. Feel free to replace the baby bok choy with another green vegetable. Broccoli and cabbage also work well. Instead of tofu, try edamame for protein. If you like your pho extra spicy, top it with a thinly sliced jalapeño pepper. The Börner V5 PowerLine Mandolin is great for paper thin veggies. Börner is generously giving away their Roko PowerLine Julienne Slicer to one lucky P&H reader! We love this tool for making quick soups, salads, and thin vegetable “noodles.” To enter, simply like Börner on Facebook and follow them on Instagram, then visit their website and leave a comment on this post letting me know which color you’d most like to win! I’ll randomly choose a winner on Friday, March 3rd at 12pm ET. Please note that the giveaway is open to US residents. Good luck! Can’t wait to get your hands on a Börner slicer? Use coupon code “picklesnhoney” to get 10% off your purchase! Thank you to Börner for sponsoring this post! Make sure you visit their website to see videos and tutorials for getting the most out of their kitchen tools. It’s really impressive how much you can do with them! Filed Under: Main Meals, Soups, Salads & Sides COPYRIGHT © 2019 Amanda Maguire. All Rights Reserved. I’ve been wanting to try making Pho at home! I love getting it out, but it would be nice to make it at home for myself. I also appreciate that this recipe is approachable for the home cook and vegan – Vietnamese food can be intimidating! I love the white powerline Roko. It looks like a handy kitchen tool! I’d love to win a purple or green slicer! Thanks for the recipe, my mom’s vegetarian, so now she can enjoy pho too! And RED for the Roko! Would love the green! I have a family of vegetarians. This would make julienning so much easier! OOOHH!!! I would love the white one 🙂 Thank you very much! What a great kitchen tool! I would pick the white one. Thanks! I know what I’ll be making for dinner tonight! 😉 I would really love to have the green julienne slicer. Thanks Amanda! The red one all the way. Looks great. Beautiful photos! I always order pho when I go out and now I know how to make my own at home! Thanks for that. Also, the white is my favorite color. I’m glad you told me about these kitchen tools. I have one mandolin I bought a while ago but it collects dust because the blades aren’t very sharp anymore. The Roko sounds VERY sharp. I would love to win the purple. Love Pho!!! Thank you for sharing! Hope I win! Thanks so much for the giveaway! I like, follow and checked the site and would be thrilled to win any of those colors! 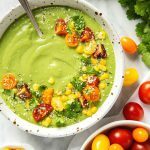 This recipe looks incredible! Your photos are so vibrant and I love your writing. 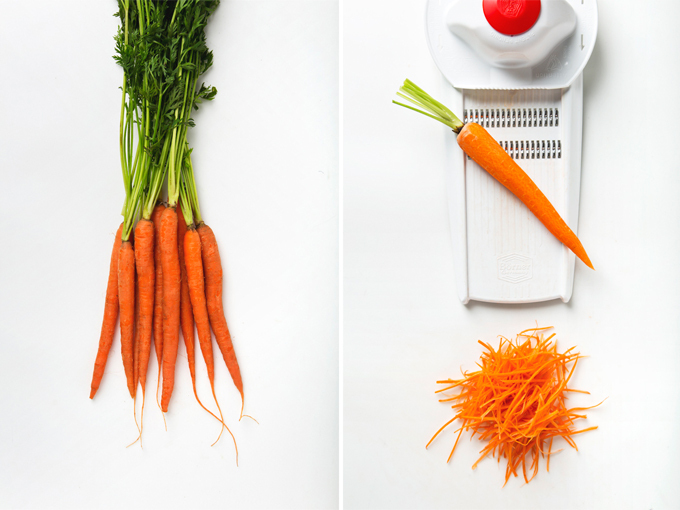 I would be so happy to win that julienne slicer in white! I would be so excited to win the purple one! I think the lime green one is just gorgeous. And now that I’ve bookmarked this recipe, I’m putting it on next week’s meal plan. Thanks! I love this recipe. Your site always inspires me to try new recipes. It would be amazing to win the white colored slicer. Thanks so much! Yay! I would love to win orange! Gosh this is a beautiful recipe. And those veggies! I’m impressed with how thin the Borner tool made them. I’ve used mandolins and spiralizers before but never seen anything like the roko. I would LOVE to win the white! I would pick purple! Thanks for the giveaway and recipe! I’d love the purple one! Thanks for the recipe and the chance to win! The white one! It looks so clean. This peeler looks awesome! Every time I try to julienne with my current peeler, the veggies always get stuck and I inevitably hurt my fingers trying to get them out. I’m digging the purple! I would like to win the orange slicer. I love the green slicer. It reminds me of Spring! Pho sho I want to win this! lol 😉 I like the white one. Thanks for the recipe! I made this noodle soup last night and like you said, I was blown away by how delicious it was. Sadly, there were no leftovers today. 🙂 I would love to be able to get my vegetables that thin. The white julienne is my favorite. Just found your blog through Facebook. Great recipes. I want to win purple! Beautiful! I would love to win the green one! following on instagram and facebook. I could really use one of these slicers. I’d love the purple! I bet this pho is a cinch with the julienne tool! I would love to win it in white. Thank you! I’d like to win the red. Green! 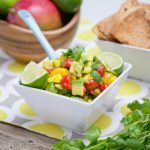 Thanks for the recipe and giveaway! I love your blog. Oooo, this looks good! I love asian noodles! I would love to win the white! Thanks for the opportunity, Amanda! Green or white for me! Thanks for the giveaway! Would love the orange color!! Awesome giveaway! I’d love to win the green! The orange one because it’s my favorite color! The white because my kitchen is white. 🙂 Thanks Amanda! This pho could not be any more beautiful. I’m planning to make it tonight, although I doubt mine will be as pretty. 😉 I would love to win the white slicer. Thanks Amanda. The green because it reminds me of Spring! You make the most wonderful recipes Amanda. This one is right up my alley and I love that you make it so simple and approachable. I would most like to win the white roko. P.S. I made your gf & vegan banana bread for my daughter’s classroom this week and the kids loved it. This soup is PERfECT on chilly days! Looks amazing and so easy! !